Johnny Holton won’t be selected tonight in the first round of the NFL Draft. But by the end of the weekend, he will almost certainly be employed by an NFL team either as a late round pick or as a college free agent. Of the hundreds of players hoping to be drafted over the next three days, the former UC wide receiver is among the most unlikely candidates to make it to pro football. “I feel like my story is one of the wildest of anybody in this year’s draft,” said Holton. If you’re not familiar with his story, Holton did not play high school football. As one of 11 children, he worked at a grocery store during his high school years to help support his family. He was eventually spotted playing flag football and got an opportunity to play at the junior college level before transferring to UC. When he sat down with teams at the NFL Scouting Combine in February, Holton made sure they knew the details. In two seasons at UC, Holton flashed big-play ability, catching 46 passes for 892 yards (19.4 ypc) and 10 touchdowns. He also had a 99-yard kick return touchdown nullified by penalty. Those numbers would have been better if he had not been hampered by a hamstring injury last season. Despite the injury, Holton showed enough potential to join Chris Moore and Mekale McKay as the three Cincinnati receivers invited to the combine. “I was pretty excited,” he said. 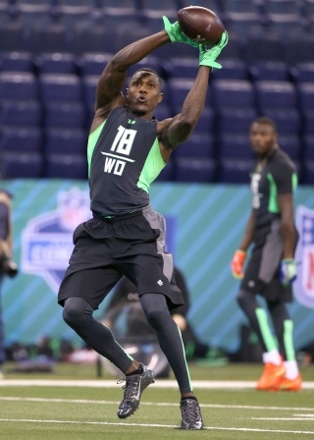 “As a kid, I always wanted to go to the combine. I used to always watch it on the NFL Network and I felt blessed to have that opportunity. Still hampered by the hamstring injury, Holton was timed at 4.54 seconds in the 40-yard dash at the combine. He improved to 4.42 at UC’s pro timing day in March and was even asked to go through some drills at defensive back. Not a ringing endorsement, but not bad considering that most people that skip high school football have NO chance of making an NFL roster.